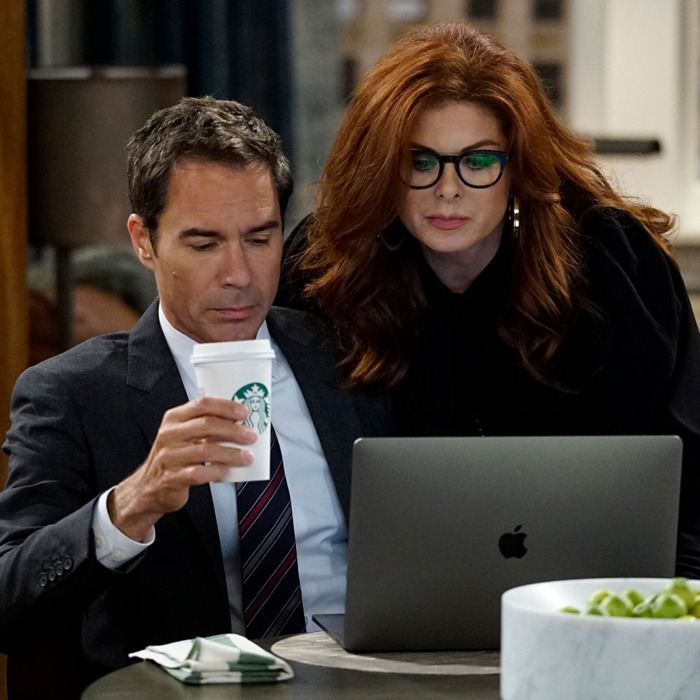 The Will & Grace revival’s first episode spins around Trump, Trumpism, and an obsessive 2017 awareness like a hyper-self-conscious tic. The characters, the apartment set, and even the costuming look eerily the same — like a song you once knew by heart, but haven’t heard for a decade — but the premises and jokes are current to the point of anxiety. Will is writing a letter to his congressman (whom he has a crush on). Grace calls him “woke.” Karen, once a joke of a one percenter, is now taking casual phone calls from her pal Melania. Jack carries out a flirtation with a Secret Service agent. And at the height of this Will & Grace–but–2017 hallucination, Will and Grace have a pillow fight in the Oval Office. In spite of how firmly the episode wants to telegraph its own wokeness, many of its laugh lines come off as familiar to the point of gentleness. We’re expected to gasp a bit at the snappy coyness of Karen assuring Melania that Grace isn’t pretty enough to be “a threat,” or maybe at the daring of Will wondering why anyone would redecorate the Oval given that the current resident will only be there for a year anyhow. But underneath the tap-dancing joke-joke-reaction-shot rhythm, one thing does actually feel subversive about the revival’s first episode. The simple reality of the premise — a Will & Grace episode that takes the Oval Office for its backdrop — is the most radical joke of the entire half-hour. Sitcom sets are a crucial, meaningful element of the genre. The central idea of the sitcom structure is about routine and regularity, and the idea of a sitcom set is that it belongs to a typical American in a typical American household. We see it over and over and come to know it intimately; even if it’s not a “normal” home that looks like the daily reality of the show’s audience, the sheer repetition of that set shapes a new normal for regular viewers. This is part of what makes a sitcom such a rich form for cultural signaling — that sitcom sofa is a mirror of our own sofas, even when the reflection is more than a little distorted. The sitcom can use ordinariness and formula to reinforce cultural norms. Every series with a shlubby sitcom dude married to a hot wife may as well have “the patriarchy” stamped over the top of it like a watermark, and many jokey brown sidekicks may as well walk on set wearing an “I reinforce hegemonic ideas of whiteness” signs. But those same tools are equally adept at cultural radicalism (see: All in the Family, but also The Carmichael Show, Black-ish, and One Day at a Time). It’s why the original Will & Grace, for all its stereotypes and exaggerations and regular missteps, for all the hollowness of the mascotlike Jack, also had cultural impact. Here was a window into an apartment with a sofa and a sink, not that different from your sofa and your sink. The people who lived in that apartment were roommates and best friends, like you and your best friend. And one of those people was gay. Everyday people, in everyday spaces. The idea of touting a gay man as an “everyday person!” is no longer radical — or, at least, it wasn’t in September of 2016. But the idea of using the Oval Office of the White House as an everyday space, its windows used as splatter screens for Grace’s spit takes, its pillows offering themselves up for silly feathery fights? That feels new. Dozens of TV shows have used the Oval Office as a backdrop. The West Wing is the most iconic, but it’s joined by legions of others – 24, Scandal, Designated Survivor, House of Cards, Veep, 1600 Penn, Commander in Chief, Madam Secretary, I could continue. In every one of those series, though, there’s a unifying foundational assumption about the Oval. It is a serious place. It’s a special place, one that invites awe and provokes reflection. We are supposed to want to be our best selves in that room. TV uses that underlying expectation — if it’s a drama, it’s Kiefer Sutherland realizing he’s now the president, walking into that room and feeling the weight of the responsibility all fall on him at once. If it’s a comedy, it’s the subversive, upsetting pleasure of Selina Meyer sitting behind the Resolute desk, cursing up a blue streak and trying to plan how to hide her cosmetic surgery from the press. But the Will & Grace revival treats the Oval Office differently. For a while it seems like Will and Grace are standing in the Oval having a political argument. “Don’t you understand that working here is a tacit endorsement of everything that happens here!” Will shouts at her. But it’s not — not really. It’s an argument about Will and Grace being too involved in each other’s lives, too co-dependent, and too quick to judgment. It is the oldest, hoariest Will & Grace topic there is, in other words. Feathers fly, and the camera cuts to an external shot of them, glimpsed through the office window. Ha-ha!, that shot says. They’re having this fight inside the Oval Office! Remember a time when a scene like this would’ve felt like they were tarnishing the gravity of the presidency? When it would’ve felt like they were the fools in the room?! LOL. The episode’s most moving bit of political commentary is not a joke at all, although it’s shaped like one. The episode closes with what looks like a MAGA hat, draped over the corner of the president’s chair. On zooming in, we see that it actually reads “Make America Gay Again.” It’s a line designed to make us chuckle, except for how sadly wistful it feels. In an episode that’s such an uncanny re-creation of Will & Grace Classic Edition, the hat stinger may be structured like a laugh line, but it’s really a plea. Wouldn’t it be great if we could travel back to 1998? Alas, we cannot. So the best Trump joke of the pilot is not the hat, nor is it the Cheetos bit, or the impeachment reference. It’s the red-hot burn of the idea that Trump has so lowered the significance of the Oval Office, has so utterly deflated our expectations for what takes place in that room, has so thoroughly diminished any anticipation of respect or awe, that an utterly normal, irreverent episode of Will & Grace could be set there. It’s not that there’s no dissonance whatsoever; there’s absolutely an “I can’t believe they’re doing this” element to the entire plot, and to all the scenes set at the White House. But that disbelief doesn’t come out of shock that they’re disrespecting the solemnity of the office. It comes out of the dissonance of hearing that oh-so-familiar patter once again, set against a backdrop of gold curtains and a curved wall. It comes out of how ordinary it all feels, and how ultimately fluffy.